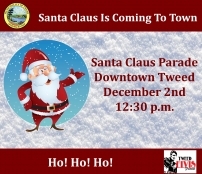 Join us on December 2nd for the Santa Claus Parade. This year we are excited to announce that we have partnered up with the Tweed Tribute To Elvis Festival to deliver the best parade yet! Meet Santa after the parade at the Tweed Lions Club. The Kiwanis Club of Tweed will be handing out hot chocolate and hot dogs to all the kids. There is plenty of events happening on Saturday so be sure to check out our events calendar. Get in the spirit of Christmas and join in on the fun.